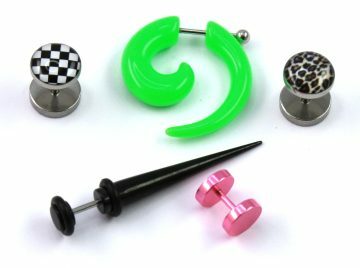 In this section you can find piercing jewellery that helps you fake a stretched earlobe. It mostly consists of surgical steel with a stainless steel bridge as a retainer between two plates. These plates can vary by color, shape or material. On the one hand acrylic made plates are often kept in shiny colours and appeal classical. On the other hand fake ear plugs designed with a motive are always manufactured as a steel edition. 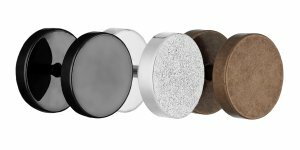 In order to simplify your choice out of such a variety of fake ear plugs, we made a comfortable segmentation into classical fake plugs, fake expanders and fake plugs with motives or crystals. Our Aspiration is not only the full range of product choice but also the enjoyable; customer orientated shopping experience at Flesh Tunnel Shop. 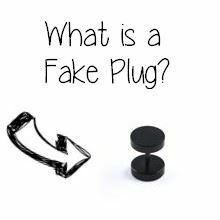 What does Fake Plug mean? 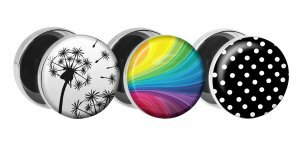 The term "fake ear plug" (also called illusion plugs or illusion ear rings) conveys a contrary impression. And there's good reason for these feelings. 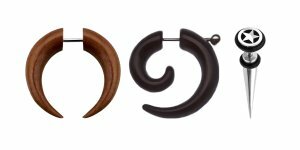 This type of body piercing fits into a standard ear piercing but looks like a proper flesh ear tunnel - hence the illusion of stretched ears. Perfect news for you? We think so too. Fake ear plugs are stylish, easy to handle and a great alternative for people who don't want to stretch their earlobes, still enjoying the overall look. So in case work, parents or your relationship don't leave room for real flesh ear tunnels - this is the solution for you. The only necessity to adopt this trend is a pierced earlobe. The bridge of a fake ear plug normally equals between 1mm and 1,2mm in diameter. Screw threads help connect the bridge with the plates. That makes it especially easy for anyone to put into his pierced earlobe. The plates usually have a size of 4mm to 12mm. Please mind the fact that the chosen plates better not top the size of your earlobes. This would reveal the illusion. The easy change of individually designed plates helps you combine your daily outfit with a new accessory. 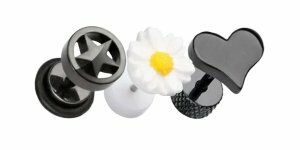 Fake ear plugs are simply ear studs with an extraordinary shape or design. They emerged in the course of the recent piercing trend. 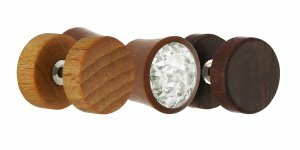 It was made for people that liked the appeal of flesh tunnels or ear plugs but wouldn't stretch their earlobes. 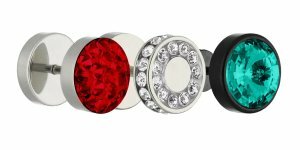 The fake plug section includes several materials that help you combine your jewellery for new exciting modifications - all day, every day. Since the bridge is mostly of stainless steel, the customization possibilities are limited to the outer plates. These plates can be flat, curved or even fluorescent. Fake ear plugs that contain o-rings give your illusion the extra realness. Synthetics like acrylic contain an advantage that makes it especially interesting for manufacturers to consider. The material can be produced in any imaginable colour and design. Whether flat or curved plates, the illusion is always perfect. Titan based fake plugs seem to be exceptional. On the one hand titan appears a most robust material. On the other hand it is relatively light. 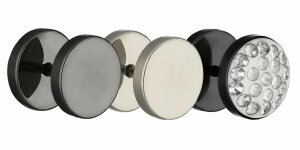 Despite the standard bridges we offer, titan based fake plugs are fully alloyed by titan. Furthermore they are covered by an epoxy coating, making it even more resisting to external influences likes scratches. 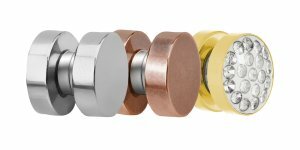 Fake plugs manufactured of surgical steel 316L impress by their robust structure and metallic glance. Various colours and shapes represent the adaptability of steel and help you choose your perfect match. The smooth surface reduces the potential of static friction and skin irritation.